It’s rare to find someone who doesn’t like ceviche, but if you are trying to eat less animals, finding a good ceviche can be a challenge. Enter- Spicy Cauliflower Ceviche with Coconut Milk & Peanuts! This recipe is honestly to die for, and you can add all sorts or additions or exchanges to make it your own. Once you have the cauliflower method down you are off and runnin’. 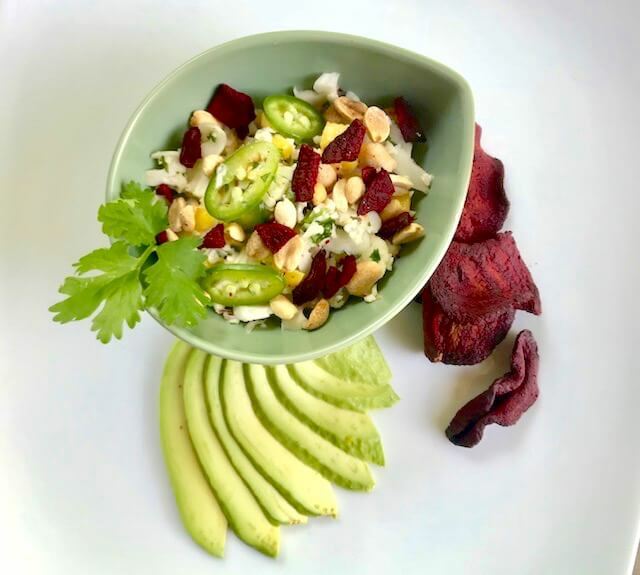 I served it with some Rhythm Superfoods Beet Chips, both on the side and crumbled on top for an interesting and sweet crunch. You can also serve with tortilla or plantain chips for dipping. It’s plant-based (aka vegan), paleo, dairy-free and dee-lish! Kelp noodles are one of my favorite ingredients these days and this Zucchini Pasta & Kelp Noodles with Sunflower Cilantro Pesto dish is a happy new addition to my growing repertoire of both kelp and zucchini noodle recipes.. I LOVE to eat and I don’t count calories. Yet there is no denying that too many of them can be unkind. Enter kelp noodles! 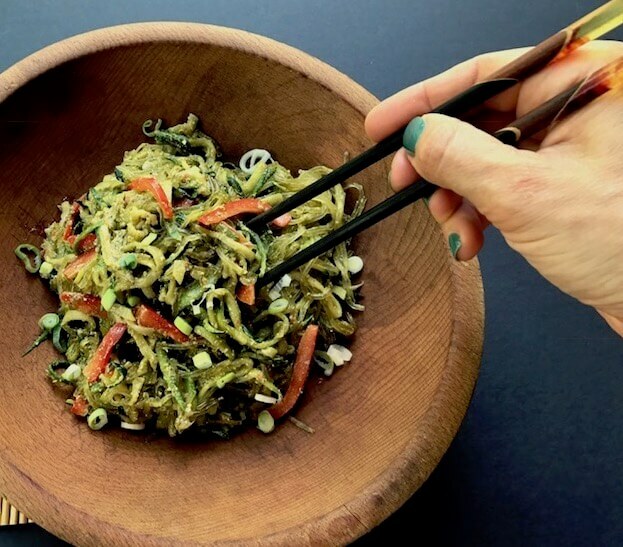 Now the words “kelp noodles” do not conjure up visions of an unctuous and mouthwatering morsel….however they have no flavor and are basically a vehicle for amazing sauces. The only trick however is that while they do not need to be cooked, they do need to be soaked in warm filtered water and baking soda for at least 20 minutes to let them soften. This is not something that you will find instructed on the packaging…it seems to be underground intel that I am happy to have, and happy to share! So whether you are ambitious to make the recipe below or you just want to throw some store-bought pesto or peanut sauce on these puppies you will not be disappointed, I promise! Sprouts are fun and easy to grow and are delicious, alkaline and packed full of vitamins, minerals and other nutrients. These fun little projects are also a great source of vitamins E, C, B and A as well as potassium, magnesium, iron, calcium and protein. Sprouting unlocks the nutrients & protein inside the plant cells more readily and makes the protein found beans as well as nuts & seeds more bioavailable and more digestible. Sprouting as well as soaking, or fermenting foods also significantly reduces enzyme inhibitors, greatly increasing the digestibility and absorption of all nutrients in food, including amino acids. For a more in-depth look at why sprouting is so awesome, check out my guy Dr. Josef Mercola’s article. Use organic beans such as adzuki, lentils, mung beans or chickpeas. The beans beans will at least double in size during sprouting, so only prepare as many sprouts as you can eat in about 4 weeks. The fastest to sprout are mung beans and lentils, especially if you live in a humid climate. 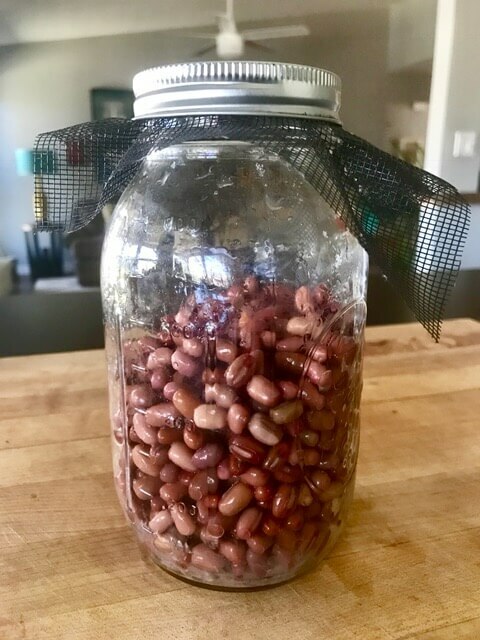 My favorite beans are adzuki beans (shown here) for their nutty texture, high protein and iron and anti-oxidant content. Most dry beans are good for sprouting but you want to avoid black beans as they can be toxic. Note that “split” beans or peas will not sprout. This outstanding Cinnamon Tahini Oatmeal Cookie recipe is an adaptation of my dear dear friend, fellow chef and devout foodie Robbin Russell. 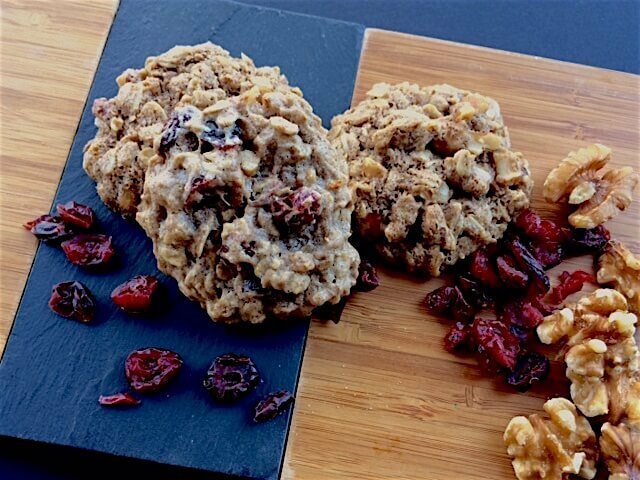 I have always been a sucker for oatmeal raisin cookies and these are a unique and easy twist to the classic cookie and of course gluten-free, refined sugar free and can be made vegan. This recipe literally takes 5 minutes to prep and only 10 minutes to bake so no excuses! There are tons of fun things that you can add to change them up to your tastes. 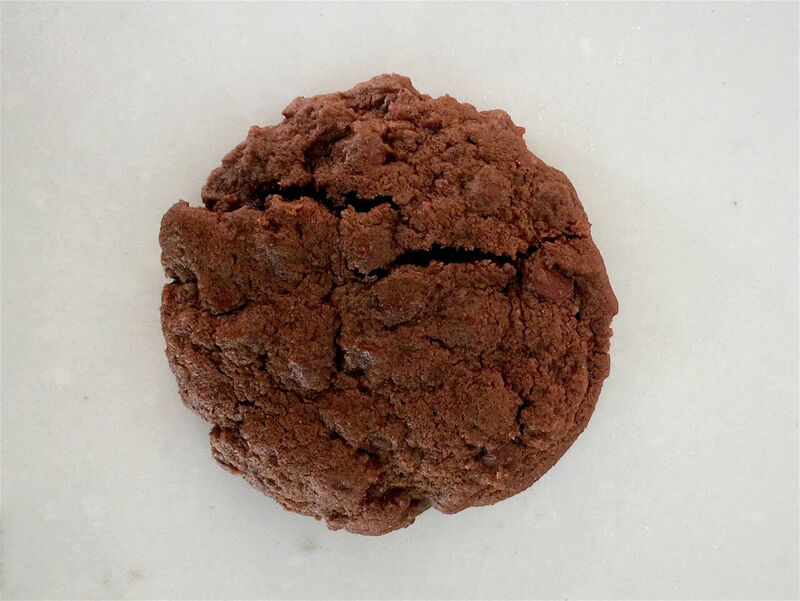 This fabulous, decadent and somewhat “naughty” recipe for Gooey Double Chocolate Chip Cookies was the brainchild of our Chef Heather Valdes. She created it for one of our clients who is not super concerned with healthier alternatives, he just wants clean and thoughtful food made in a classic style. You may know by now that at The Naked Bite we rarely use conventional baking recipes so of course we needed to experiment on our own and try a “nicer” version. Both are here for you to choose which option you want to make, whether your feeling naughty OR nice. Thank you Heather, my husband just LOVES himself some double chocolate chip cookies! Austin LOVES tacos…well and who doesn’t quite frankly? I think we love them because they can be filled with just about anything- which is part of the fun. 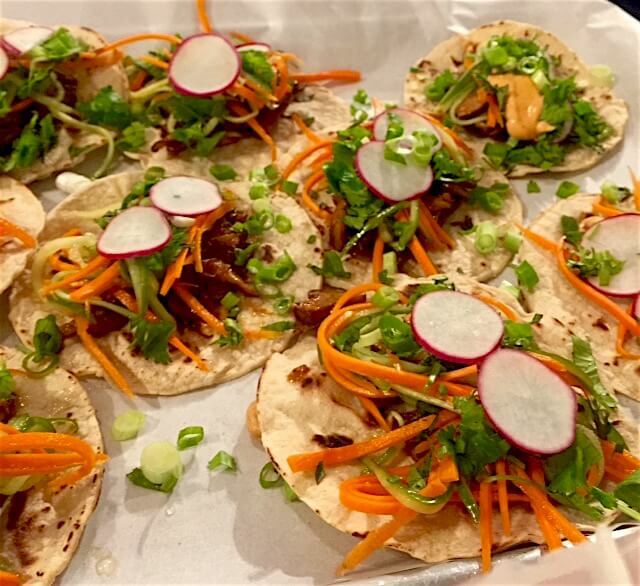 Get creative to celebrate National Taco Day or just follow the this delicious and plant-based and paleo friendly recipe below for Eggplant Banh Mi Tacos and you cannot go wrong. This recipe was developed in collaboration with our incredibly talented chef Heather Valdes for a summer cooking class. The initial recipe was made with shiitake mushrooms, yum! This one was adjusted to use up some of the bountiful eggplant happening in Austin & Miami right now. 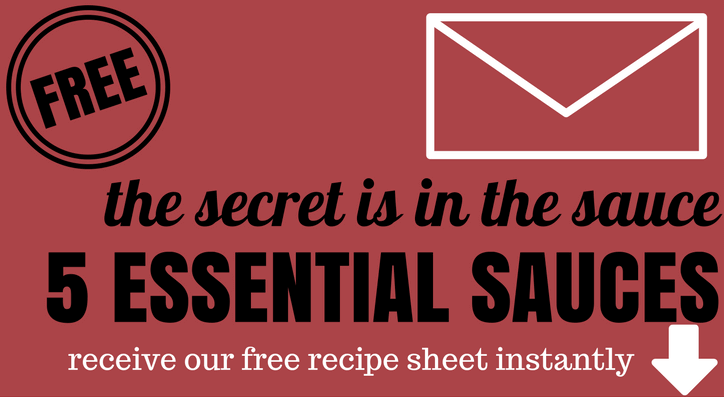 Whatever your filling choice, this is a great template for all sorts of interesting options. Quick Pickled Veggies: Add all ingredients to a large glass jar, secure the lid, and shake for 10 to 15 seconds to mix. You’ll want to allow the vegetables to soak for at least 30 minutes (at room temp) up to 24 hours- the longer the better. If you plan to do hours in advance, place the jar in the fridge until ready to assemble. Eggplant Filling: Whisk together the maple syrup, tamari, chili garlic paste, rice vinegar, garlic, ginger and black pepper in a small mixing bowl and set aside. Heat a large sauté pan over high heat, add the coconut oil and the eggplant and reduce the heat to medium­ and cover. Cook for 8-10 minutes, stirring as needed to prevent burning. Add the tamari mixture to the pan and cook for another 2 to 3 minutes, or until the sauce is absorbed, stirring frequently. Remove from the heat. Fill each corn tortilla with a small spoonful of the eggplant and then the pickled vegetables. Drizzle with the aioli (recipe follows) and top with the fresh, cilantro, mint, scallions and peanuts if using. Serve immediately. This recipe would also be delicious with a variety of mushrooms or other veggies such as squash, peppers, cauliflower or broccoli. Mix all of the ingredients together in a small bowl. Allow to sit overnight for flavor to develop if you have time.